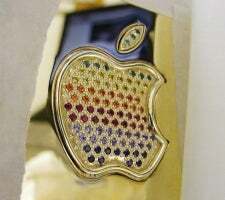 Behold the 24 karat gold MacBook Air with a bejeweled version of the classic rainbow Apple. Why anyone would want a heavier, fingerprint-magnet version of a MacBook Air except a rich oil tycoon from the United Arab Emirates, I don't know. But even while all the shiny gold and colored sapphires may look tacky at first, I have to admit that it actually looks kind of cool when you see the whole thing. See it, along with all the info about the bling job and price, after the jump. OK, so maybe it only looks cool if a) you just woke up from a 1977s cocaine-induced coma after a night in Studio 54, b) you can't resist the allure of the rainbow Apple and wear gold underpants, c) you were Snoop Dogg's stylist in Sensual Seduction or d) all of the above. Either way, I wonder how many pounds all that gold adds to the Air, and how many dollars it would subtract from my wallet.